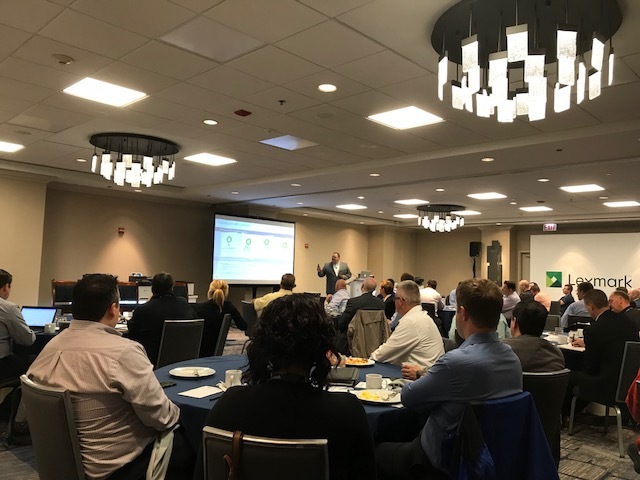 Lexmark’s “ALL-STAR” Experience | Industry Analysts, Inc.
By R.J. Stasieczko, BEI Services – Well, The Lexmark Roadshow had its final stop, the great city of Chicago. The shows on-going theme was Winning, helping dealers Win is their mission, and giving Dealers the data to win is BEI’s mission. What a great wrap up it was. If you have never eaten at Mastro’s, youmust put it on your list. Today, it is great Customer Experiences which protect and maintain great customer relationships. After eating at Mastro’s,I would conclude that those who have great relationships with their current favorite restaurant would trade those relationships in quickly for the Mastro’s Experience. After dinner,we all headed to a private NBA watch party hosted by 5 Time All-Star, Tim Hardaway. Data in the NBA is just as critical as data in The Imaging Channel. Without data, the NBA draft pick might simply focus on all the tall players, easily missing the fact that a tall player who trips all the time is as useless to the team as 11/17-inch paper cassettes to over 80% of the customers who buy copiers. Awareness, without the ability to become aware, we might feel the pain of being made aware. The ability to learn from data, and listen to data and imagine what could be, is what creates what will be. Strategy, without a strategy your results will most often be determined by others, whose strategy was using your complacencyto beat you. Discipline, the Discipline to implement or the Discipline to modify based on staying aware will determine your deliverables relevance. The market has shifted, andsome would say; it has shifted off the paper. Customers will not accept outdated strategies and dealers won’t survive if their visions of the future are builtfrom their memories. No Dealer wants to be sitting in the conference room they named “Complacent” and hear the sales rep named Paul Revere yelling – Office Depot is Coming! !, Office Depot is Coming!! Awareness, Strategy, and Discipline will re-invent our industry. Let’s stop trying to save something that needs to be re-invented. I close with my final observation from Chicago. Let’s not become Sears, remember visions built from memories will always blur the realities of the future. This entry was posted in BEI and tagged bei, Lexmark by andyslawetsky. Bookmark the permalink.